Pinckney Bend Cask Finished Gin is designed around the concept that if each botanical is distilled and crafted individually, a distiller can bring out the best in it. Basket and vapor infusion? Maceration and high heat distillation? It’s all about what best expresses the ingredient they’re working with. This gin starts as their American Dry Gin before being rested inside used, white oak barrels. 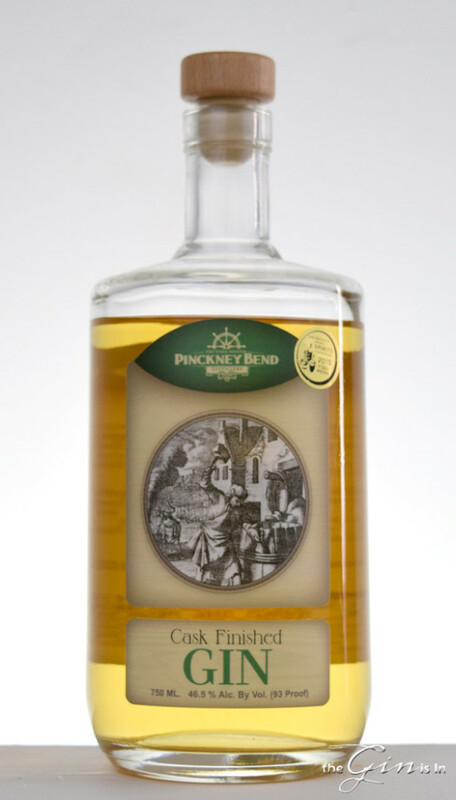 Pinckney Bend Cask Finished Gin is a gorgeous goldenrod hue, shimmering with a bright, almost translucent golden color. Inside the bottle, it’s certainly one of the most attractive barrel aged gins I’ve scene. The nose shimmers as well, with spice, coriander, hints of vanilla, orange rind, and white peppercorn cracked over creme anglaise sauce. It’s certainly a bit gin like, but some of those wood-tinged notes and botanical accords combine to create a complex, perfumed nose. You might get what I got the first time, or you might come back and get juniper and cinnamon bark notes. Really quite a bit going on in here. The palate of Pinckney Bend Cask Finished Gin is round and nicely balanced throughout, ending with a dry, comforting warmth. At the beginning juniper and citrus, all leading up to a creamy vanilla, violet and lavender note mid palate. The alcohol begins to warm a bit, as a wood influence creaminess mediates brisk juniper and the slightest hint of sweet licorice and angelica stalk. The finish is medium long with a warm, young whiskey character with residual juniper and lemon. Lovely from start to finish. I can say without a doubt that this is really lovely to drink simply on its own, but I did enjoy it in the more traditional Negroni, and the somewhat less traditional Martinez. It mixes surprisingly well, though I suggest keeping it to an Old Fashioned or Neat. Well designed, Pinckney Bend Cask Finished Gin is an aged gin that you can hang your hat on. I’d say the only negative I can find is that it’s relatively hard to find. So St-Louisites* among us gin lovers can make us jealous and brag just a little bit. For all the rest, it’s worth seeking out next time you pass through. *I’m aware, probably not the proper demonym. The cask finished Gin is brilliant with Campari. It is somewhere between a Negroni and a Boulevardier.